A woman who wanted to improve her tan ended up ruining a couple’s wedding photos when she refused to move from her sunbathing spot. I can see the two sides to this story – on the one hand, once you’re in the perfect sunbathing spot, it can be hard to be persuaded to move for fear you’ll end up in a worse position that results in a worse tan. On the other hand, your wedding day is probably the most memorable day of your life, and you want to capture it on camera without having a semi-naked stranger lying on the grass in your shot. 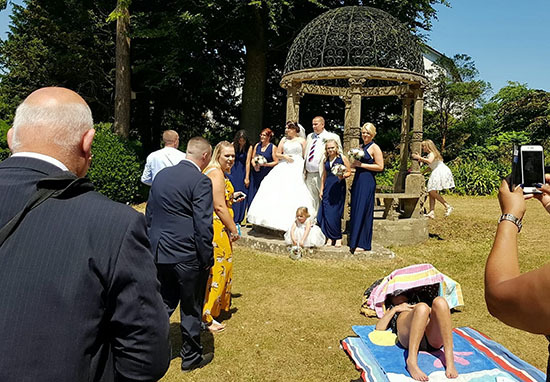 England wouldn’t usually be the place to worry about having a sunbather ruin your wedding photos, but with the current heatwave that’s taken hold throughout the UK, Mark Ling and Mandy Cripwell had this very issue. The couple got married on Saturday, (June 30) and went to take their wedding photos at an idyllic spot in Devon, at Tessier Gardens, next to Furrough Cross Church in Torquay. Unfortunately, a woman had also thought of this spot as the ideal place for sunbathing, and didn’t want to give it up for the couple. The newlyweds claim they asked the woman to move, but she refused. Later, Mark’s son approached the woman, attempting to get her to move again, but she pretended to be asleep. I went up to her and asked her to move and she pretended to be asleep. Later she was asked to move again by the limo driver and she did but she left her stuff in plain view. It’s a well known wedding spot where you have photos taken, so she would have known it goes on there. Half of Torquay have their wedding photos in that garden. The wedding party proceeded to pose in the area despite the sunbather – the photographer might have to use photoshop to replace the woman with an attractive flower arrangement or something equally wedding-appropriate. She was surrounded by wedding guests, the couple were behind her and the photographer kept calling different people over for pictures – so she knew what was going on. I don’t know if the photographer got any good photos or not? Eventually she got up and left after about 10 minutes of us being there taking photos – but she still left all her stuff there. It was bloody rude and disrespectful. A lot of people on social media have taken sides, with one person calling the sunbather an ‘icon’, while another called her an ‘idiot’. An icon. Why should married people have more rights than the rest of us?